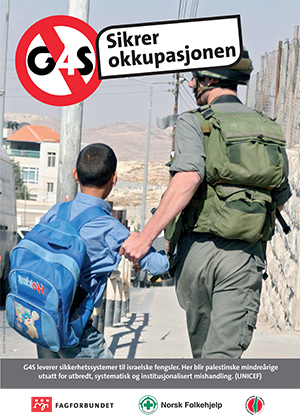 The University of Bergen in Norway has chosen not to use G4S as its security contractor due to the firm’s role in the Israeli prison system and illegal Israeli settlements. The move follows the decision by the University of Oslo last year to end its contract with G4S following a student campaign over its role in shoring up Israeli apartheid. G4S is contracted to provide services and equipment to prisons inside Israel, where Palestinian political prisoners are held without trial and subjected to torture. The company also provides services and equipment to illegal Israeli settlements, checkpoints, Israel’s wall in the West Bank and the Israeli military. Palestinian organizations have called for campaigns against G4S to hold it account for its role in Israel’s prison system. There are now active G4S campaigns in more than ten countries and trade unions, not-for-profit groups, banks and public bodies across Europe have cut their ties to G4S. G4S was initially the cheapest bidder to respond to the university’s ad for a security contractor. Apparently keen not to award the contract to G4S but also aware that Norwegian procurement law makes it difficult for a public authority not to select the cheapest bidder, the university ruled that hiring G4S would cause damage to the university’s reputation worth 2.5 million Norwegian krone ($420,000). G4S had offered a price that was around 2 million Norwegian krone ($340,000) cheaper than any of its competitors. The campaign against G4S in Norway is backed by 21 organizations, including many major trade unions, political parties and faith groups and has been widely reported on by mainstream media outlets in recent months. Last month, the campaign held a national week of action involving meetings, demonstrations and the handing in of a petition to the G4S Norway headquarters. It is testament to the strength and reach of the campaign that a major university has decided that hiring G4S would cause it such costly damage to reputation.